We are approaching that time of year when we make resolutions and plans for the year ahead. If you want this to be the year you hit bestseller lists, consider some history. Many first-time novelists expect to be an over-night sensation with their first book, during the first year. We’ve all heard a story that went viral like a global disease. When this happens to a book the back story will often reveal an author who spent decades developing their craft in obscurity even if there were other books already published. Science and math have calculated ten years and a million words before a novelist creates a novel worth reading, fortunately art defies logic. News of artistic success often includes that phrase, “follow your passion” which is baloney. Many have passion for art, music, and books; few have the talent to create. Writing; music, art, dance, etc. is often an obsession that takes over our lifestyle choices. Having some talent added to that obsession is what actually justifies striving for success, through years of really hard and thankless work, which is flavored with fun because there is passion. In ancient times, before ebooks and social media, those best-seller-overnight-sensations were publisher business decisions with strategic marketing campaigns. The novelists got “break-out publicity” from the publisher with book four if the prior three novels had earned out on costs and generated a profit. The “break out novel” was a standard practice for cultivating an authors’ career and to boost profits. If a big publicity push didn’t boost sales, careers died with that novel. Large print runs for the break out novel, and the back list, were included because readers who find a novelist they like will immediately look for more stories by that author. One example is Dan Brown. I had never heard of him before “The DaVinci Code” and it was his fourth novel. Angels and Demons was the prequel; a stronger novel which introduced the main character, religious iconology, and the fictional field of symbology, so the break-out marketing campaign was publicity for both books and a total win for the publisher, author, and readers. Hollywood and Tom Hanks also jumped into that story. Novelists may have more options for getting published today, than a decade ago, but basic business principles for generating sales still apply. First, the novel needs to be well-written and worth reading. Second, readers need to hear about that novel and know where to buy it. When enough readers buy that novel it makes money for the author. But, remember the above example and consider your potential of making more money on your first novel after the fourth one is released. The changes in the business of publishing from “before kindle” (in 2007) relate primarily to the cost of production and distribution. Finding readers and connecting with the audience is still in the magic and myth realm, of which social media is only one spoke on the wheel. Some books soar, others wallow. Readers are an integral part of the success of a story. Readers are fickle creatures who only read what they want to read, when they want to read it, and they will dither over the cost of the novel, and the investment of their time to read it, when maybe they could be or doing something that requires less emotional energy like going to a movie, concert, or knitting while watching the news. Readers have a variety of interests and are busy. Having books to read on their phone, while waiting for anything, is a dream come true. Listening to audio books instead of the news is preferred by others. A novel has to touch an emotional chord with enough readers to generate buzz. Buzz is the term for being something worth sharing across cyber space, and buzz will launch an unknown into a household name around the globe. There’s no guarantee when or if that will happen. But when it does, readers will add lots of passion to the news. A break-out-novel only launches a career if that author has more stories of similar style/type either already written or quickly produced. That similar style/type of story matters as the author is first discovered by readers. Only consider venturing into other genres and story realms after three or four similar books to that first novel. Remember that no one likes drastic changes, especially readers. If your first book is a snarky rom-com set in New York City don’t plan your second book to be a sweeping saga of Amish farm life in central PA, even if both novels are set in the year of 1860 or 2460. An author will always have to balance why they write, and what they write, with how it benefits their readers and their own life. Write good books. Maintain a sleek and dynamic website while writing good books. Plan strategic publicity online and in person, for the good books you wrote, and you will build a career as an author. Be aware of who and what your audience will find when they search on your name or book title. Look at that picture again. 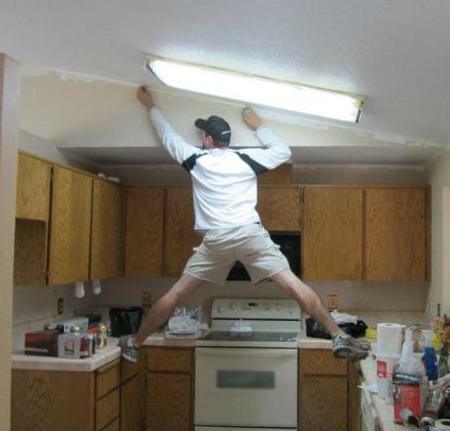 There are many ways to paint a kitchen ceiling. You could use a sprayer, brush, or a roller. You can use handle extensions; ladders, chairs or stools. You could stand on the countertops and walk across the stove. That man is my son-in-law and he is actually taping off the ceiling in preparation for painting the walls. He wasn’t posing for a picture that could go viral. He was having fun doing a job that day and he’s not a painter, nor is it his kitchen. His back story includes years in Tai Kwan Do, restaurant management, and now he’s a welding teacher at the community college. When I took this picture he was approaching his 40th birthday and had been cancer free for over five years. He was helping paint a ceiling because his wife has three sisters and we all get involved when one of us buys a new house. This is my example of why back story always makes a first glance more interesting. Consider both your personal and professional history when making a career plan and marketing plan for next year. Take the long view regarding your career as a novelist. You’ve got the talent because you have completed a novel and are now published. Your obsession is now being fed by readers who want you to write more! Challenge yourself to make each novel better than the one before. Create your stories with passion and your readers will buzz about you for the length of your career. Happy Holidays and have a Glorious New Year. This entry was posted in Soul Mate Publishing and tagged author, books, career, craft. Bookmark the permalink. Great piece. Really hits home for me as I pen my fourth novel. Thanks for sharing. How fun. I am finally getting my 2nd whipped into shape. Fantastic post! So wise! Thank you! I hope lots of authors enjoy thier creating time more. Great explanation of ‘overnight success!’ Thanks for sharing Terri and good luck with the painting!